The liver hanging maneuver is a novel technique that is widely used in open liver resection. The hanging technique has been rarely applied during laparoscopic liver resection because a blind dissection between the anterior surface of the inferior vena cava and the liver is required. Dissection between the right and middle hepatic vein is necessary in right hepatectomy, as is dissection between the middle and left hepatic vein in left hepatectomy. 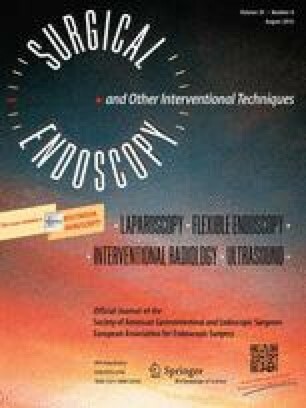 The aim of this study was to introduce the lateral approach liver hanging maneuver in laparoscopic anatomical liver resections. For this technique, the upper end of the hanging tape was placed on the lateral side of the right or left hepatic vein and the lower end of the hanging tape between three Glisson’s pedicles. The pathway of the tape was situated along the lateral side of the inferior vena cava in right-sided hepatectomy or the ligamentum venosum in left-sided hepatectomy. From February 2013 to October 2014, this technique was performed in 35 patients. Of these patients, ten patients underwent a right hepatectomy, 5 patients underwent a right posterior sectionectomy, 12 patients underwent a left hepatectomy, and 8 patients underwent a left lateral sectionectomy. The median operative time was 240 min (range 90–390 min), and median blood loss was 350 ml (range 60–700 ml). Blood transfusion was required in six patients (17.1 %). In two patients (5.7 %), postoperative complications were observed due to intra-abdominal fluid collection and pneumonia, respectively. No postoperative mortality was encountered. The lateral approach liver hanging maneuver is a simple, safe, and reproducible approach as dissection of the anterior surface of the inferior vena cava and between the three major hepatic veins is not required. This technique may be useful in laparoscopic anatomical liver resections. The online version of this article (doi: 10.1007/s00464-015-4663-2) contains supplementary material, which is available to authorized users. J.H. Kim, D.H. Ryu, L.C. Jang, and J.W. Choi have no conflicts of interest or financial ties to disclose, and they also do not have any commercial relationships.